The New Rosy Roma Diaper Odor Deodorizer with it's floral scent is used to get rid of the poo smells on contact. You get up to 150 uses out of one bottle that is compact, perfect for diaper bags or where ever. How to Use: Simply apply it on to the poo, coating it with a light coat. When you are ready, close up the diaper and throw it away. 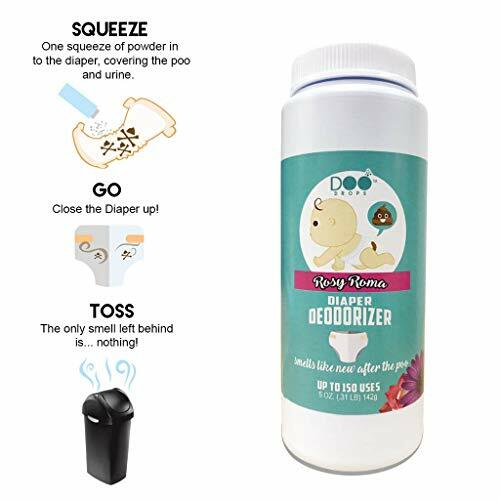 The deodorizer works to keep the area you have the diapers in from stinking. Whether you have a diaper bin or trash can in the garage, prevent the awful smells that come alive when you open the lid. When diaper is open while changing baby, coat the feces and then close up the diaper and throw it away. The deodorizer will ensure that that dirty little diaper doesn't stink up where ever you're at. If you have any questions about this product by Doo Drops, contact us by completing and submitting the form below. If you are looking for a specif part number, please include it with your message.